Tattooing as an art has been going on for millennia but you may not have realised quite how long. The oldest discovery of tattoos were on a mummy dating from 6000BC!! Now that’s what you call a permanent tattoo! In ancient Indian tribes, tattoos were extremely common, sometimes made by rubbing ash or dye directly into cuts. These tattoos would be of cultural symbols or to represent different caste-based systems. Whereas in China tattoos were considered a barbaric practice and usually only seen on bandits or slaves, characters being tattooed directly onto the face to show ‘slave’ or ‘prisoner’. In ancient Egypt it was almost directly the opposite with tattoos mainly being found on women to show high status. In the Philippines tattooing was the widespread culture pre the European invasions. These tattoos showed rank and power and were even believed sometimes to have magical qualities. In Japan tattoos were for spiritual and decorative purposes. At different times tattoos were used to show rank and then later only used by the lower classes such as manual workers and prostitutes. But things took a different turn of events when the Samurai were forced to disband. Being forced to burn their armour they took to tattooing themselves to show the Samurai identity. Unfortunately later tattoos were banned forcing all of these tattooed people into the underworld as they would not be accepted into normal society. There is a funny story from the Island of Samoa. When the Dutch first came across this island and saw the natives from the ships they described them as friendly and with no traces of savagery. They specifically recorded that they had no tattoos and wore artfully woven silk tights or breeches. Only later do they discover that they are not wearing leggings but their legs were fully covered in tattoos! If you have come to regret your tattoo just remember that living in modern times means you do not have to live with it for ever! 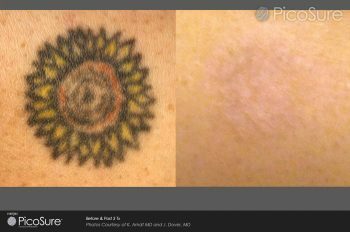 Full tattoo removal is in as little as 3-6 treatments is available to you!